This article is about ruins in architecture. For other uses of Ruin and Ruins, see Ruins (disambiguation). "Ruined" redirects here. For the play by Lynn Nottage, see Ruined (play). For the EP by Ceremony, see Ruined (EP). 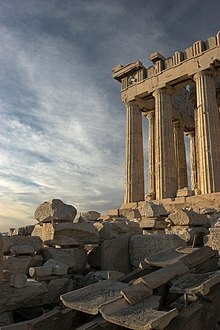 Ruins (from Latin ruina, meaning 'a collapse') are the remains of human-made architecture: structures that were once intact have fallen, as time went by, into a state of partial or total disrepair, due to lack of maintenance or deliberate acts of destruction. Natural disaster, war and population decline are the most common root causes, with many structures becoming progressively derelict over time due to long-term weathering and scavenging. There are famous ruins all over the world, from ancient sites in China, the Indus valley and Judea to Zimbabwe in Africa, ancient Greek, Egyptian and Roman sites in the Mediterranean basin, and Incan and Mayan sites in the Americas. Ruins are of great importance to historians, archaeologists and anthropologists, whether they were once individual fortifications, places of worship, ancient universities, houses and utility buildings, or entire villages, towns and cities. Many ruins have become UNESCO World Heritage Sites in recent years, to identify and preserve them as areas of outstanding value to humanity. Ancient cities were often highly militarized and fortified defensive settlements. In times of war they were the central focus of armed conflict and would be sacked and ruined in defeat. Although less central to modern conflict, vast areas of 20th-century cities such as Warsaw, Dresden, Coventry, Stalingrad, Königsberg, and Berlin were left in ruins following World War II, and a number of major cities around the world – such as Beirut, Kabul, Sarajevo, Grozny and Baghdad – have been partially or completely ruined in recent years as a result of more localised warfare. Ury House, Aberdeenshire ruined by removal of the roof after the Second World War to avoid taxation. Apart from acts of war, some important historic buildings have fallen victim to deliberate acts of destruction as a consequence of social, political and economic factors. The spoliation of public monuments in Rome was under way during the fourth century, when it was covered in protective legislation in the Theodosian Code and in new legislation of Majorian. and the dismantling increased once popes were free of imperial restrictions. Marble was still being burned for agricultural lime in the Roman Campagna into the nineteenth century. In the 20th century, a number of European historic buildings fell into ruin as a result of taxation policies, which required all structures with roofs to pay substantial property tax. The owners of these buildings, like Fetteresso Castle (now restored) and Slains Castle in Scotland, deliberately destroyed their roofs in protest at, and defiance of, the new taxes. Other decrees of government have had a more direct result, such as the case of Beverston Castle, in which the English parliament ordered significant destruction of the castle to prevent it being used by opposition Royalists. Post-colonial Ireland has encouraged the ruin of grand Georgian houses, symbols of British imperialism. As a rule, towers built of steel are dismantled, when not used any more, because their construction can be either rebuilt on a new site or if the state of construction does not allow a direct reuse, the metal can be recycled economically. However, sometimes tower basements remain, because their removal can sometimes be expensive. One example of such a basement is the basement of the former radio mast of Deutschlandsender Herzberg/Elster. The basements of large wooden towers such as Transmitter Ismaning may also be left behind, because removing them would be difficult. The contemplation of "rust belt" post-industrial ruins is in its infancy. The ruins of the Parthenon in Athens, Greece. Much of the original marble which formed the roof and frieze now forms a pile of rubble at its base. In the Middle Ages Roman ruins were inconvenient impediments to modern life, quarries for pre-shaped blocks for building projects, or marble to be burnt for agricultural lime, and subjects for satisfying commentaries on the triumph of Christianity and the general sense of the world's decay, in what was assumed to be its last age, before the Second Coming. With the Renaissance, ruins took on new roles among a cultural elite, as examples for a consciously revived and purified architecture all' antica, and for a new aesthetic appreciation of their innate beauty as objects of venerable decay. The chance discovery of Nero's Domus Aurea at the turn of the sixteenth century, and the early excavations at Herculaneum and Pompeii had marked effects on current architectural styles, in Raphael's Rooms at the Vatican and in neoclassical interiors, respectively. The new sense of historicism that accompanied neoclassicism led some artists and designers to conceive of the modern classicising monuments of their own day as they would one day appear as ruins. In the period of Romanticism ruins (mostly of castles) were frequent object for painters, place of meetings of romantic poets, nationalist students etc. (e.g. Bezděz Castle in Bohemia, Hambach Castle in Germany, Devin Castle in Slovakia). Ruin value (German: Ruinenwert) is the concept that a building be designed such that if it eventually collapsed, it would leave behind aesthetically pleasing ruins that would last far longer without any maintenance at all. Joseph Michael Gandy completed for Sir John Soane in 1832 an atmospheric watercolor of the architect's vast Bank of England rotunda as a picturesquely overgrown ruin, that is an icon of Romanticism. Ruinenwert was popularized in the 20th century by Albert Speer while planning for the 1936 Summer Olympics and published as Die Ruinenwerttheorie ("The Theory of Ruin Value"). Ruins remain a popular subject for painting and creative photography and are often romanticized in film and literature, providing scenic backdrops or used as metaphors for other forms of decline or decay. For example, the ruins of Dunstanburgh Castle in England inspired Turner to create several paintings; in 1989 the ruined Dunnottar Castle in Scotland was used for filming of Hamlet. ^ "Nalanda University Ruins | Nalanda Travel Guide | Ancient Nalanda Site". Travel News India. 2016-10-05. Retrieved 2017-02-18. ^ Centre, UNESCO World Heritage. "World Heritage". whc.unesco.org. Retrieved 19 March 2018. ^ Codex Theodosianus, xv.1.14, 1.19, 1.43. ^ See Dale Kinney, "Spolia from the Baths of Caracalla in Sta. Maria in Trastevere", The Art Bulletin 68.3 (September 1986):379-397) especially "The status of Roman architectural marbles in the Middle Ages", pp 387-90. ^ A selection chosen for their picturesque value, appear in Simon Marsden (photos), Duncan McLaren (text), In Ruins: The Once Great Houses of Ireland, 1980, expanded ed. 1997. ^ But see Tim Edensor, Industrial ruins: spaces, aesthetics and materiality, 2005. ^ The European career of the pleasure and pathos absorbed from the European contemplation of ruins has been explored by Christopher Woodward, In Ruins (Chatto & Windus), 2001. Wikimedia Commons has media related to Ruins. This page was last edited on 11 March 2019, at 01:21 (UTC).